Many well seasoned dog owners warn against the dangers of canine bloat and vets even give recommendations on how to prevent your dog from suffering from canine bloat but some dog owners have no idea what this illness is, how it occurs or how to prevent it. Read on to learn everything you ever wanted to know about canine bloat. 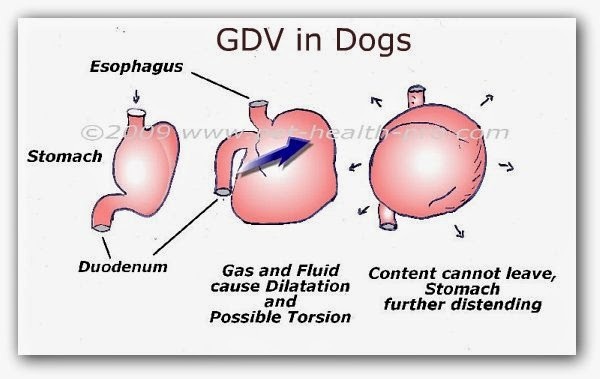 Canine bloat is the regularly used term for the illness but often times it is referred to by the scientific term Gastric Dilitation-Volvulus (GDV) of simply Gastric Dilation. 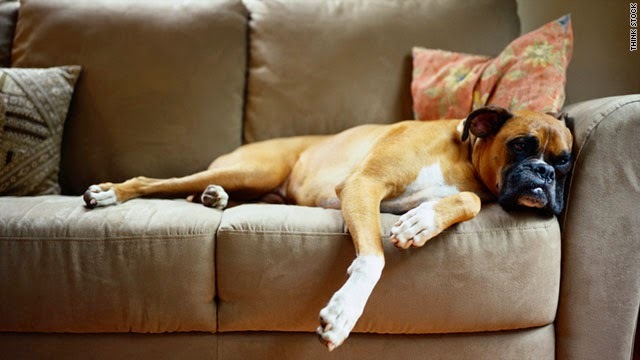 Canine bloat as it will be referred to from here on out, is a particularly serious and often life threatening illness that strikes a good many dogs every year and the outcome of each dogs affliction depends on a variety of factors. The biggest factor in helping a dog to survive canine bloat is the speed with which treatment is administered to a dog suffering from bloat. When bloat occurs, the dog’s stomach fills with air, fluid and/or food. The enlarged stomach puts pressure on other organs, can cause difficulty breathing, and eventually may decrease blood supply to a dog’s vital organs. People often use the word "bloat" to refer to a life-threatening condition that requires immediate veterinary care known as gastric dilatation-volvulus (GDV), gastric torsion and twisted stomach. This condition can cause rapid clinical signs and death in several hours. 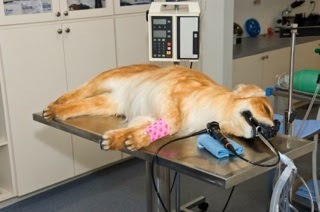 Even with immediate treatment, approximately 25% to 40% of dogs die from this medical emergency. Veterinarians have no definitive data as to why canine bloat occurs and despite attempts to intentionally recreate canine bloat in laboratories they have been unsuccessful in doing so as of yet. There are, however, a variety of theories relating to factors that are believed to contribute to bloating. Theories about what causes GDV abound, including issues related to anatomy, environment, and care. There are certain factors and practices that appear to increase the risk of GDV, some of which fly in the face of conventional wisdom. This body shape may increase the risk of bloat because of a change in the relationship between the esophagus and the stomach. In dogs with deeper abdomens, the stretching of the gastric ligaments over time may allow the stomach to descend relative to the esophagus, thus increasing the gastroesophageal angle, and this may promote bloat. All dog guardians should be familiar with the signs of bloat, and be ready to rush their dog to the vet if any of the symptoms are present. Likelihood of an incident of bloat seems to increase with age. Purdue reports that there is a 20 percent increase in risk for each year increase in age. This may be related to increased weakness, over time, in the ligaments holding the stomach in place. Personality and stress also seem to play a role. Risk of GDV was increased by 257 percent in fearful dogs versus nonfearful dogs. Dogs described as having a happy personality bloated less frequently than other dogs. Dogs who eat rapidly and are given just one large meal per day have an increased susceptibility to GDV than other dogs. The Purdue research found that for both large- and giant-breed dogs, the risk of GDV was highest for dogs fed a larger volume of food once daily. Dogs fed a dry food that included a fat source in the first four ingredients were 170 percent more likely to bloat than dogs who were fed food without fat in the first four ingredients. In addition, the risk of GDV increased 320 percent in dogs fed dry foods that contained citric acid and were moistened before feeding. On the other hand, a rendered meat meal that included bone among the first four ingredients lowered risk by 53 percent. It is often recommended that limiting exercise and water before and after eating will decrease the risk of bloat. Dog’s Breed—Large-breed dogs are most susceptible, although on occasion, small dogs may bloat too. Dogs that are “deep-chested.” This means the length of the chest from backbone to sternum is long and the width of the chest is narrower. Dogs that have ancestor-history of bloating. It’s thought to be hereditary. Anxious or fearful temperament. These dogs should always eat in an environment made as peaceful as possible for them. Aggressive dogs. Numbers five and six indicate that “nerves” or emotions can play a role in triggering a bloat episode. Male dogs get it more than females. Dogs older than seven years of age are more at risk than those that are younger. What Are the General Symptoms of Bloat/GDV in Dogs? It is a good idea to have on hand at home an over the counter drug such as Phazyme, Mylanta Gas (not regular Mylanta) or Gas-X. They contain simethicone which helps reduce gas. This may buy you a little more time to get to a vet. How Can I Prevent Bloat/GDV?